H2 is an Open Source embedded Java SQL database. It is a fast, in-memory database with a very small footprint of a single jar file (around 1.5-megabyte) size. Therefore you can easily embed the H2 database into your application for rapid development. H2 Database also provides a built-in web console to interact with the database. You can use H2 database as an in-memory database, embedded database or network database. Please note, H2 database is not a full-fledged SQL implementation, it supports only a subset of the SQL standard. You can find more details about the H2 Database from the official website. Why do I need an in-memory database? Can I not just connect to MySQL or other real databases? Well yes, you definitely can. But development java application connecting to a real database involves a lot of overhead. Also, during development, your schema is bound to change as the software evolves. Also when working on distributed teams, you don’t want your code to fail when someone else in team updates the DB schema. Multiple developers should be able to run the DB tests in parallel. For such cases, an in-memory database is an ideal solution. An in-memory database is created when an application starts up and destroyed when the application is stopped. If you’re using Maven build tools for your Spring boot application, then you need to add the following package dependency in your pom.xml file. And, if you are on Gradle, you can include the following package dependency in your build.gradle file. 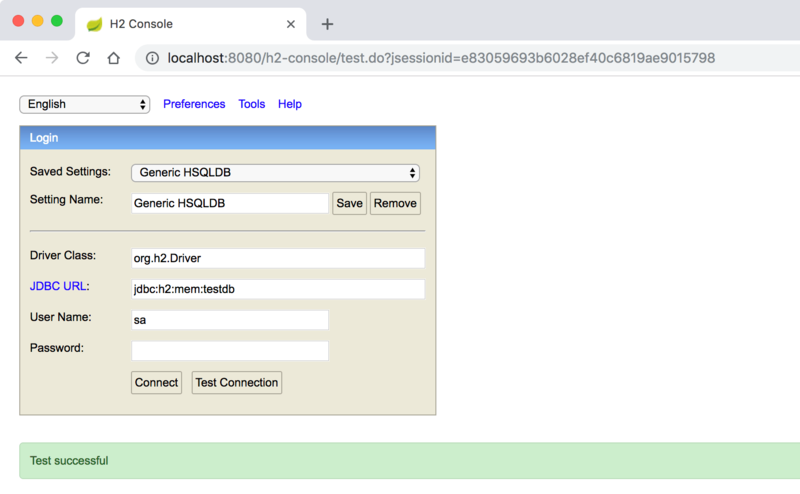 As we discussed earlier, H2 database provides a Web console to interact with the database. To enable the console, you need to add the following property to your application.properties file. Make sure that you use jdbc:h2:mem:testdb as JDBC URL.